Tickets for all MAT dance performances will be General Admission. For tickets visit TicketDFW.com or call 214-871-5000. Tickets to studio theater shows will only be available at the door. Have questions about tickets, arts pass or vouchers click here to see our FAQ’s. 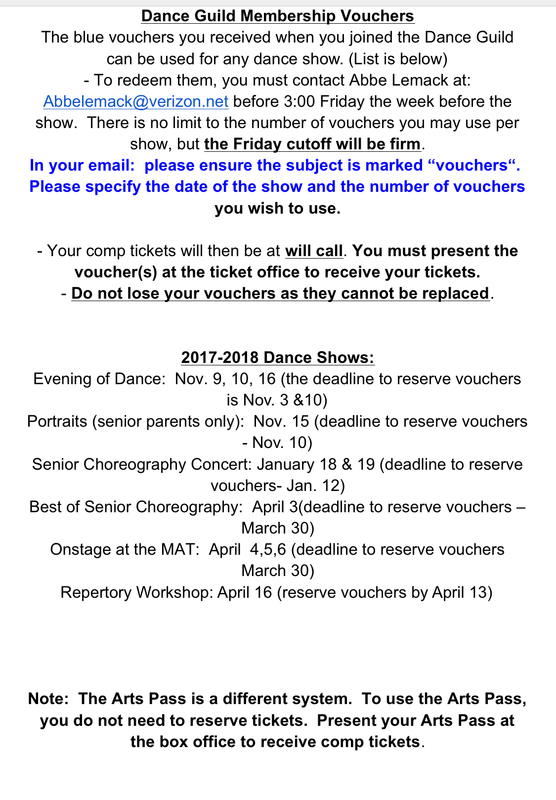 To redeem your vouchers, you must contact Abbe Lemack by TEXT at 972-814-6875 before 12:00 noon Friday the week before the show. If you use a voucher, your comp tickets will be at will call the night of the show. You MUST present the voucher at the ticket office to receive your tickets. Do not lose your vouchers as they cannot be replaced. There is no limit to the number of vouchers you may use per show, but the Friday cutoff will be firm. Tickets must be picked up at least 15 minutes prior to the show. Arts Passes are only good for a certain number of admissions depending on which level card you purchased. We ask that each family contribute 50.00 towards dinners that are served to all dancers, teachers and crew for our two largest dance events. See below for the two payment options.